Grand Canyon National Park is known for nature, trails, historic sites, scenic drive, and adventure. Your plan includes some of its best attractions: explore the stunning scenery at Grand Canyon South Rim, trek along South Kaibab Trail, get great views at Mather Point, and stroll through Rim Trail. For maps, reviews, where to stay, and other tourist information, read our Grand Canyon National Park journey planner. Thomaston to Grand Canyon National Park is an approximately 17.5-hour flight. You can also drive. You'll gain 2 hours traveling from Thomaston to Grand Canyon National Park due to the time zone difference. When traveling from Thomaston in December, plan for a bit cooler days and much colder nights in Grand Canyon National Park: temperatures range from 45°F by day to 15°F at night. Cap off your sightseeing on the 5th (Wed) early enough to travel to San Francisco. Kick off your visit on the 6th (Thu): hunt for treasures at Ferry Plaza Farmers Market, step off the mainland to explore Alcatraz Island, then snap pictures at Golden Gate Bridge, and finally pause for some serene contemplation at Glad Tidings Church. Get ready for a full day of sightseeing on the next day: appreciate the extensive heritage of Filbert Steps, shop like a local with Ferry Building Marketplace, then take in the waterfront at The Embarcadero, then take a leisurely stroll along Fisherman's Wharf, and finally steep yourself in history at SS Jeremiah O'Brien. 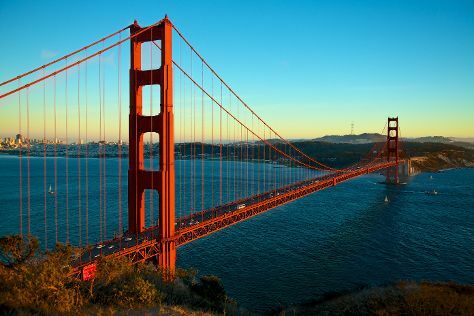 For where to stay, other places to visit, ratings, and more tourist information, read San Francisco trip planner. You can do a combination of bus and flight from Grand Canyon National Park to San Francisco in 9 hours. Alternatively, you can do a combination of bus, flight, and subway; or drive. Due to the time zone difference, you'll gain 1 hour traveling from Grand Canyon National Park to San Francisco. Traveling from Grand Canyon National Park in December, you will find days in San Francisco are a bit warmer (59°F), and nights are much warmer (45°F). Cap off your sightseeing on the 8th (Sat) early enough to travel to Las Vegas. On the next day, immerse yourself in nature at Red Rock Canyon National Conservation Area, take in nature's colorful creations at Bellagio Conservatory & Botanical Gardens, and then ponder the design of Bellagio Fountains. For traveler tips, photos, where to stay, and other tourist information, use the Las Vegas trip itinerary builder tool . You can fly from San Francisco to Las Vegas in 4 hours. Alternatively, you can do a combination of subway and flight; or drive. Traveling from San Francisco in December, plan for slightly colder nights in Las Vegas, with lows around 39°F. Finish up your sightseeing early on the 11th (Tue) so you can travel back home.